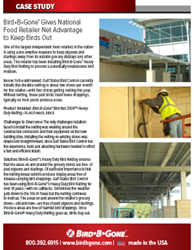 Bird B Gone, the leader in professional grade bird control products for commercial, industrial and residential applications reveals how its bird netting keeps pest birds from the stores of a major Texas retailer. Heavy-Duty Bird Netting serves as a pre-emptive measure to keep pigeons and starlings away from its stores. In a case study involving one of the largest independent food retailers in the nation, Bird B Gone documents how its Heavy-Duty Bird Netting serves as a pre-emptive measure to keep pigeons and starlings away from its stores. Installed by Gulf States Bird Control, Bird B Gone’s black, ¾-inch mesh Heavy-Duty Bird Netting keeps birds away from outside grocery displays and other areas. Gulf States Bird Control currently installs this durable netting in about two of the retailer’s stores per month—with four stores getting netting this year. Without netting, these pest birds could leave droppings, typically on front porch produce areas. The only challenges installers faced to install the netting was working around the construction contractors and their equipment on the new building sites. Installing the netting on existing stores was simple and straightforward, since Gulf States Bird Control has the experience, tools and attaching hardware needed to effect a fast and efficient install. Bird B Gone’s Heavy-Duty Bird Netting ensures that the areas on and around the grocery stores are free of pest pigeons and starlings. Of particular importance is that the netting keep outside produce display areas free of disease carrying bird droppings. Gulf States Bird Control has been using Bird B Gone’s Heavy-Duty Bird Netting for over 18 years—with no callbacks. Sometimes the weather gets down to the 30s in Texas but the netting continues to hold up. Specially fabricated of a tough UV-stabilized polyethylene mesh, Bird B Gone’s Heavy-Duty Bird Netting is rot-proof, waterproof and flame resistant. The netting is made up of six monofilaments, each 0.0012 thick and twisted together to produce a strong twine with 160-200 twists per meter. This durable netting is designed to perform as an effective bird deterrent through a wide range of temperatures—from -250F to +270F. This netting meets the requirement of ISO 1806 & 9001 Protocol Mesh Test for quality and mesh break strength. This bird netting is also non-conductive, which means it can be used around electrical systems and RF transmission systems without worrying about shorts or interference. One installed, the netting is virtually invisible. Each net is thoroughly inspected, tagged and signed before leaving Bird B Gone’s warehouse. The netting is backed by an industry leading 10-Year Guarantee (for black netting). Bird Net 2000 comes in several stock sizes, as well as custom cuts up to 200 feet in length or width. Same-day shipping is available even for custom cuts. The netting is also available in three different mesh sizes to effectively control the species of pest bird in the area where birds have become a problem. There’s the 2-inch mesh for gulls, cormorants and larger birds; the 1-1/8-inch mesh for pigeons and crows; and the ¾-inch mesh for smaller birds like starlings and finches. Bird Net 2000 also comes in several colors—black, stone or white—to blend in with its background and be less visually intrusive. Bird B Gone is the world’s largest manufacturer and distributor of bird control products, providing effective and humane solutions to a bird-free environment. The company provides advice; training and installation services for those who need help with these and other bird control measures. For the complete line of products from Bird B Gone, call 1-800-392-6915; fax: 949-472-3116 or visit our website at http://www.birdbgone.com, e-mail: nobirds(at)birdbgone(dot)com.